This cake is every chocolate lover’s dream come true. It contains chocolate from three different sources, four if you want to ice it with chocolate frosting, but the cake comes out so moist it’s not really necessary. If a fussy eater turns up their nose at this dessert, then there is no hope for them. 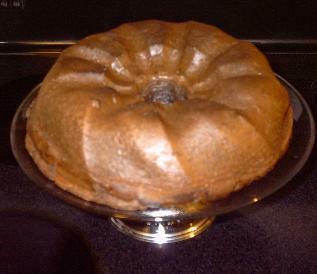 This cake is not made entirely from scratch, so it is a lot easier to make than the angel food cakes. The first time I made this cake was to bring to a family gathering. I keep getting requests to bring it for other family outings. It makes a great choice for a birthday cake. In a large bowl, stir together the cake and pudding mixes. Dig a hole in the middle of the mix and pour in the melted butter, sour cream and eggs. Using an electric mixer, beat ingredients on low speed until blended, then scrape the bowl and continue beating on medium speed for another four to five minutes. Blend in the chocolate chips with a wooden spoon. Preheat the oven to 350 degrees F (175 degrees C) and grease a 10 inch bunt pan. Bake for 50 to 55 minutes. Let cool for 10 minutes after removing cake from the oven before turning out onto a wire rack to cool completely. Possible recipe changes: Ice the cake, add nuts.